Line from the film: "The great thing about being around Graham was that he adored bad taste"
It had been 18 years since they last appeared together. John Cleese, Michael Palin, Terry Gilliam, Terry Jones, and Eric Idle. Even Graham Chapman, who died in 1989, was there (his ashes, anyway, encased in a tastefully decorated urn). They’ve all had their successes separately; Michael Palin hosted some amazing travel documentaries for the BBC, and Terry Gilliam has become a world-class director, creating such fantasy classics as Time Bandits and Brazil. Together, though, these six men will always be known as Monty Python, and Monty Python Live at Aspen is as much a tribute to their incredible accomplishments as it is a refreshing walk down memory lane. Hosted by Robert Klein, Live at Aspen was recorded in front of a studio audience at the 1998 U.S. Comedy Arts Festival in Aspen, Colorado. 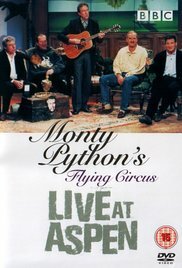 All five living Pythons (as well as the lone dead one) were in attendance, reminiscing about the early days of Monty Python's Flying Circus, their BBC-produced television show (including how the initial audience didn’t “get” their humor), and the freedom they experienced while writing and performing their sketches, many of which should be enshrined in the Comedy Hall of Fame (if there is such a thing). Along with the behind-the-scenes stories, we’re treated to clips from their various skits, such as the wildly popular “Dead Parrot” routine (Michale Palin recalls that it was his mechanic at the time who inspired this particular sketch; whenever his car would give him trouble, this mechanic would tell him that everything was fine). When the TV show ended, the Pythons turned their attention to the big screen, and in the process churned out comedy gold: Monty Python and the Holy Grail, Life of Brian, and The Meaning of Life. Again, some clips are shown, like the Black Knight scene in Holy Grail and the always disgusting Mr. Creosole segment from The Meaning of Life (alas, there were no snippets from Life of Brian, due, apparently, to some legal issue they were experiencing with that movie at the time). There are even scenes from their live performance at the Hollywood Bowl (the “Sit on my Face” barbershop quartet is hilarious), and a brief discussion of the shows they did for German TV (including a bizarre tale of how they were met at the airport by the German producers, then immediately shuttled off to Dachau for a tour of the infamous camp. To this day, they have no idea why). As a fan, I loved seeing them all together again, and the Pythons showed that, after all these years, they could still make people smile; Eddie Izzard pops up at the beginning (posing as part of the group), though, ironically, it was Graham Chapman’s ashes that got the biggest laugh of the night. There were even some celebrities in the crowd (I noticed just about every cast member from the hit TV series Cheers). If you love Python like I do, Live at Aspen will serve as a reminder of how great they once were, and reassure you that, after all these years, they haven’t lost their touch.